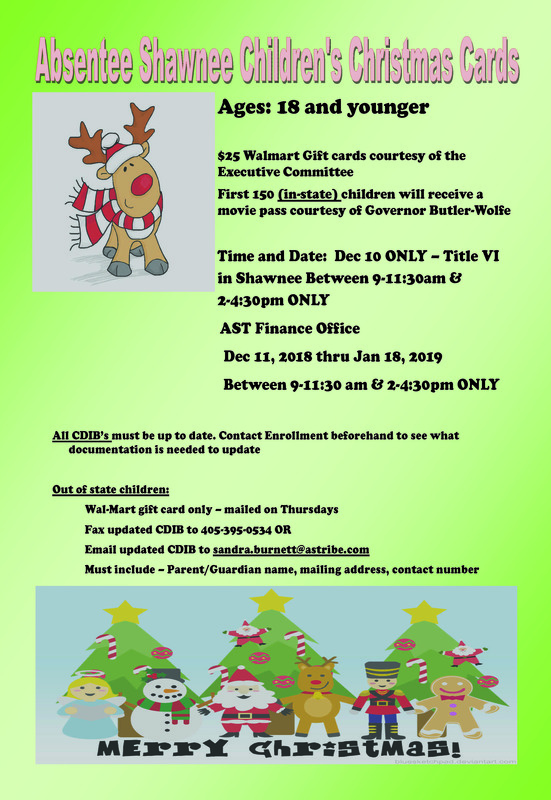 The Absentee Shawnee Tribe will provide to its youngest citizens a gift card and to the first 100 children, a movie pass courtesy of Governor Edwina Butler-Wolfe on Monday, December 10th in Shawnee at the Title 6 building from 9:00 AM - 11:30 AM and then 2:00 PM to 4:30 PM. Distribution will also occur December 11th through January 18, 2019 during those same schedule hours but at the AST Finance department. Must present an updated CDIB card and to update, please contact the AST Enrollment Office beforehand. Out-of-state AST child citizens will be mailed a gift card only. For more information, please contact the AST Enrollment Office or Finance at (405) 275-4030.